Bright Mixed Bouquet Bright Mixed Bouquet, our fall-themed floral arrangement is the quintessential bouquet for festive autumn gatherings, these blooms make a standout gift 3 yellow roses 3 orange or Red Gerberas 3 yellow lilies (m.. Romantic and charming this bouquet in a vase is full of good vibrations not only to conquer the hearts but to keep it warm. Beautiful selected red roses, pink carnations and white daisies combined in a clear vase to delight anyone. 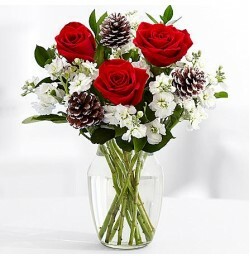 Inclu..
Christmas Bouquet, flower to Sao Paulo , bouquet is a winter wonderland of frosted pinecones, red roses, white spray stock and greens. 3 red roses 3 white spray stock 3 snowflocked pinecone picks ( or similar ) 3 stems of g..
Deluxe Flowers Days is packed with Mix of roses, lisianthus, gerberas and Lilies spray make up this delicate bouque flowers, guaranteed for all occasions. Flower delivery sao paulo Size 40 x 45 18 Branches Packaged for gift If you need he..
With an abundant collection of Stargazer lilies (a heaven sent heavenly scent!) 4 Lilies star gazer 3 green spray hypericum ( or similar) 3 ruscus (or similar) Smal Teddy bear Ferrero rocher Ribbon wrapped Live help..
What a gorgeous arrangement! This collection of mixed pink lilies, pink and white gerberas, red roses, colored daisies and foliage in a glass vase is ideal to present someone with on any date! Wrapped in a sophisticated way with a touch of k.. These beautiful white lilies a Simple and elegant, this bouquet of fragrant white lilies fresh from the fields, flowers to sao paulo 4 stems of white oriental lilies (2-4 blooms per stem) 4 stems daisies (2 - 4 blooms per stem) 3 stem.. 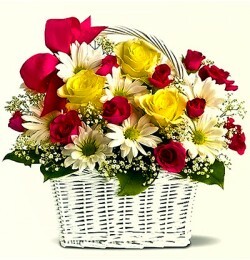 Surprised and enchanted will be your reaction in front of this gorgeous mixed basket. Item: Mixed flowers in a basket (colors or basket may vary) Deluxe - 12h x 15w Same day deliver order placed before 1pm (Monday-Friday) Free shipping ..
My Pincess Bouquet While some romantic moments simply can’t be planned, others can be delivered to her doorstep on your day of choice Iten 3 hastes Lilies 6 pink roses gift-wrapped with ribbon Live help whatsapp Fl..
Beautiful colorful bouquet with mix flowers - gerberas, wild flowers, Anastacia, carnations, alstroemerias 9 Branches Packaged for gift If you need help whatsapp +5533999612577 Same day deliver monday / friday order pl..
XOXO is shorthand for lots of hugs and kisses, which is what you'll get when you send your lady love this charming bouquet. 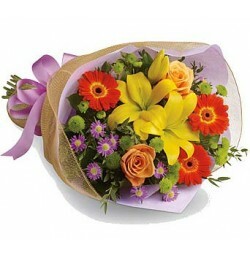 This lush bouquet includes regular roses and spray roses, asiatic lilies, and miniature carnations, accented with assorted..